Welcome from Morag and Ali Cameron- the proud owners of Camerons Cottage,Loch Ness in Scotland. 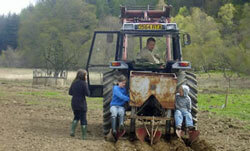 Ali has lived on Glenlia Farm for all of his life and has a great knowlege of the area. As well as running the farm and Camerons Holiday Cottage and Camerons Tea Room & Farm Shop we have 4 children which keep us very busy. 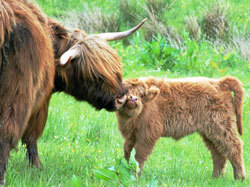 We breed highland cattle on the Farm which produce their calves in the warm summer months. 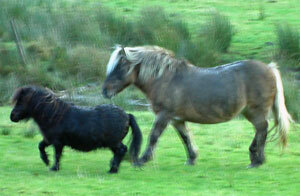 We also have highland and shetland ponies (RUMMY AND ODEN) who are the best of friends. We are the 4th generation of Camerons on the Farm. It used to be a dairy farm producing cream, milk and butter and Ali's grandfather would then deliver the goods all around the local community using his trusty horse and cart as transport. The cottage was a derelict barn for a number of years before we set out to renovate the barns. With a lot of hard work the exterior now looks as it may have many years ago. The interior has been thoroughly updated and modernised for the cottage to be enjoyed by all of our guests. Our aim is to make your highland holiday in Camerons Cottage as enjoyable and relaxing as possible with every comfort provided. We personally attend to the full maintenance of the cottage. Our priority is to ensure we keep the high standard we have set in order to make Camerons the luxury cottage for all our guests to enjoy. We are very excited to have our own Camerons Tearoom and Farm Shop on Glenlia Farm, where you will be able to buy local produce and local crafts and also enjoy the welcoming taste of home baking and freshly prepared food.